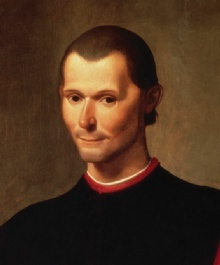 Niccolo Machiavelli (born as Niccolò di Bernardo dei Machiavelli in Florence, Italy, died in Florence, Italy) was a famous Writer from Italy, who lived between May 3, 1469 and June 21, 1527. He became 58 years old. Niccolò di Bernardo dei Machiavelli was an Italian writer, statesman, diplomat and philosopher. He lived in Florence in the Renaissance period and was one of this period's most important people. State Chancellor of the Republican government in 1498-1512, when he was deposed and imprisoned by the Medici who then came back to power. He worked his way up again to a central position and influence in Florence. The year after he came out of prison, his major work Il Principe (The Prince) (1513) released and later discussions of the first ten books of Titus Livy (1513-21). Today, perhaps Machiavelli is best known for its treatment of the concept of power. This was recorded in the book The Prince. The book is written as a voice for an upcoming first presents itself as a practical guide for managers in the use of force - hence the name - as a philosophical discussion of the concept of power. Machiavelli's approach to power is just as relevant today as in the 1500s, although his thoughts on the subject now being criticized by some for being cynical. Machiavelli makes it clear that a ruler has the right to use all means in the state's interest, but this requires an impeccable personal ethics, and that the state's interests and the Prince's personal interests must be sharply separated. The phrase "the purpose justifies the means" is often attributed to Machiavelli, but it's not a quote from him, rather one of several possible, and perhaps a somewhat extreme interpretation of his work, The Prince and ignores key elements of his discussion. He has also written historical works and social satirical comedies. He is born under the zodiac taurus, who is known for Security, Subtle strength, Appreciation, Instruction, Patience. Our collection contains 48 quotes who is written / told by Niccolo, under the main topics: Business, War. "Hence it comes about that all armed Prophets have been victorious, and all unarmed Prophets have been destroyed"
"He who wishes to be obeyed must know how to command"
"God is not willing to do everything, and thus take away our free will and that share of glory which belongs to us"
"For among other evils caused by being disarmed, it renders you contemptible; which is one of those disgraceful things which a prince must guard against"
"Entrepreneurs are simply those who understand that there is little difference between obstacle and opportunity and are able to turn both to their advantage"
"Benefits should be conferred gradually; and in that way they will taste better"
"Before all else, be armed"
"A wise ruler ought never to keep faith when by doing so it would be against his interests"
"A son can bear with equanimity the loss of his father, but the loss of his inheritance may drive him to despair"
"A return to first principles in a republic is sometimes caused by the simple virtues of one man. His good example has such an influence that the good men strive to imitate him, and the wicked are ashamed to lead a life so contrary to his example"
"A prince never lacks legitimate reasons to break his promise"
"The fact is that a man who wants to act virtuously in every way necessarily comes to grief among so many who are not virtuous"
"Politics have no relation to morals"
"When you disarm the people, you commence to offend them and show that you distrust them either through cowardice or lack of confidence, and both of these opinions generate hatred"
"Whosoever desires constant success must change his conduct with the times"
"One who deceives will always find those who allow themselves to be deceived"
"We cannot attribute to fortune or virtue that which is achieved without either"
"The first method for estimating the intelligence of a ruler is to look at the men he has around him"
"There is no surer sign of decay in a country than to see the rites of religion held in contempt"
"There is no avoiding war; it can only be postponed to the advantage of others"
"There are three kinds of intelligence: one kind understands things for itself, the other appreciates what others can understand, the third understands neither for itself nor through others. This first kind is excellent, the second good, and the third kind useless"
"The wish to acquire more is admittedly a very natural and common thing; and when men succeed in this they are always praised rather than condemned. But when they lack the ability to do so and yet want to acquire more at all costs, they deserve condemnation for their mistakes"
"The wise man does at once what the fool does finally"
"The promise given was a necessity of the past: the word broken is a necessity of the present"
"The one who adapts his policy to the times prospers, and likewise that the one whose policy clashes with the demands of the times does not"
"The new ruler must determine all the injuries that he will need to inflict. He must inflict them once and for all"
"The more sand has escaped from the hourglass of our life, the clearer we should see through it"
"One change always leaves the way open for the establishment of others"
"Of mankind we may say in general they are fickle, hypocritical, and greedy of gain"
"Never was anything great achieved without danger"
"Nature that framed us of four elements, warring within our breasts for regiment, doth teach us all to have aspiring minds"
"Men should be either treated generously or destroyed, because they take revenge for slight injuries - for heavy ones they cannot"
"Men rise from one ambition to another: first, they seek to secure themselves against attack, and then they attack others"
"Men ought either to be indulged or utterly destroyed, for if you merely offend them they take vengeance, but if you injure them greatly they are unable to retaliate, so that the injury done to a man ought to be such that vengeance cannot be feared"
"Men are so simple and yield so readily to the desires of the moment that he who will trick will always find another who will suffer to be tricked"
"Men are so simple and so much inclined to obey immediate needs that a deceiver will never lack victims for his deceptions"
"It is not titles that honor men, but men that honor titles"
"It is necessary for him who lays out a state and arranges laws for it to presuppose that all men are evil and that they are always going to act according to the wickedness of their spirits whenever they have free scope"
"It is much more secure to be feared than to be loved"
"It is double pleasure to deceive the deceiver"
"I'm not interested in preserving the status quo; I want to overthrow it"